Landing pages are standalone web pages that your contacts or potential contacts can “land” on when they click through from an email, ad, or other digital location. Marketers typically use landing pages to achieve specific, short-term goals. For example, you might create a landing page to promote a limited-time offer or sell a specific product. Landing Pages are free to use and available to all Mailchimp users. In this article, you'll learn how Landing Pages work in Mailchimp, and how you can use them to streamline your marketing. To get started you'll choose a template and use our Landing Page builder to design and configure your pages. It works a lot like our Email Designer, so you have control over your layout and can add or remove content blocks as needed. The biggest benefit? Our landing page templates are simple and easy to use, but the impact can be huge. All landing pages you publish are live on the web and have a unique URL, so you can share them and use them in your other campaigns and marketing materials. Copy your landing page URLs and share them on any social media platform to drive traffic to your page. Want to know what makes a successful landing page? To get some help with your design or see more landing page examples, check out these tips and get those creative juices flowing. Ready to do this thing? Learn how to create a landing page. For information about how landing page URLs work and how you can edit them, take a look at our article About Landing Page URLs. If you own your domain, you can use your own domain on a landing page URL. 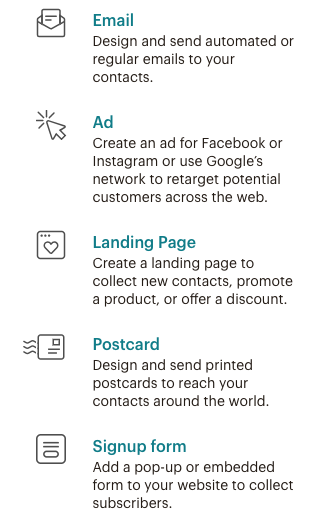 For an more in depth look at how people are interacting with your landing pages, take a look at how you can Track with Mailchimp, use Facebook Pixel, and add Google Analytics. Want to know what kind of metrics you can collect with your published landing pages? Check out Landing Page Reports.